Without sound forklift safety training in place, accidents are bound to increase. That’s the primary reason the U.S. Occupational Safety & Health Administration (OSHA) creates guidelines and safety regulations for every U.S. workplace. 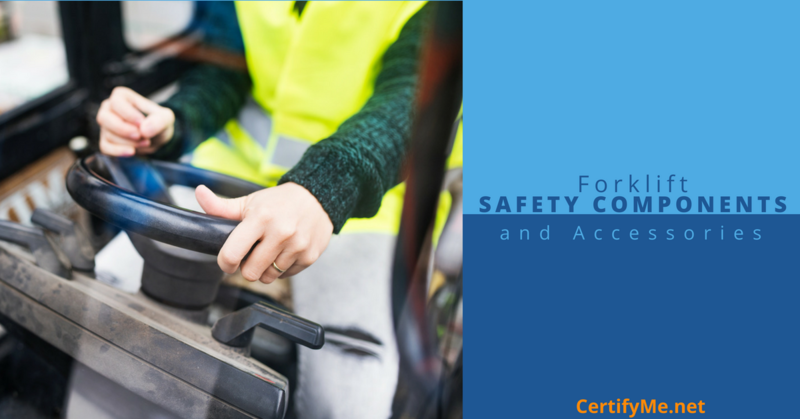 OSHA’s training recommendations are designed to give every forklift operator the skills, knowledge, and safety awareness to properly drive a forklift without an accident. Powered industrial trucks (the term OSHA uses to classify forklifts) are involved with many accidents each year, some resulting in injuries and fatalities. Browse through OSHA’s accident database, and it’s not hard to find serious forklift accidents. On a yearly basis, powered industrial truck incidents always rank near the top of the most common industrial accidents in the United States. Notice what all those factors have in common? They’re all related to the driver and supporting staff (including maintenance personnel). Clearly, the human factor can’t be overlooked when it comes to forklift safety. This article will focus on the other aspect of good forklift safety practices – the electrical and mechanical components on a forklift that enhance overall safety. Every forklift comes with standard safety equipment, and there are also some great add-ons that can make any forklift safer. Let’s take a look at both types. Headlights – just like an automobile, a forklift needs headlights to navigate dimly lit areas, and also alert oncoming traffic. Some forklifts come with low beam and high beam settings. Horn – from hidden corners to sudden emergencies, a forklift’s horn is the main audio advance warning available on standard lifts. Warning lights – along with the horn and other audio indicators, warning lights provide greater visibility to a forklift in many different working environments, both inside and outside. Cab cover – driver protection is important, especially at construction sites and similar workplaces. Every standard forklift provides some sort of cab cover, although many pallet jacks and some order pickers don’t have a cover mechanism. Fork tilt warning lights – specialized warning lights can alert drivers when their forks aren’t aligned, which is helpful in preventing product and cargo spills, pallet damage, and more. This safety device mounts in the operator control cabin. The forks are already one of the most important parts on a forklift, and tilt warning lights add upgraded safety to these key forklift components. Laser visual aids – installed and activated on a forklift’s lifting mechanism, guidance lasers allow for more accurate loading and unloading. Plus, they help prevent pallet and shelf damage as well. Lockout devices – prevent needless forklift accidents with this upgraded safety device. Lockout devices are located in the cabin and key area, and they restrict access to operate the lift. Lockout devices are ideal during lunch hours, shutdowns, and other situations. LED safety lights and headlights – when standard lights aren’t visible enough, try an LED upgrade. LED lights install directly in place of standard lights, and are one of the most popular forklift safety add-ons on the market today. Blind spot and backup cameras – while some standard lifts include blind spot and backup cameras, they’re more of a safety add-on currently. These helpful devices are mounted in the cabin control area, giving the driver an extra set of eyes on potentially hazardous areas. Sign Up with CertifyMe.net Today! From proper safety guidance from OSHA to helpful components, safe forklift driving is a combination of smart, common-sense action and safety-first forklift driving aids and other accessories. One without the other could spell disaster; even if you’re the most careful driver around, not having the proper forklift safety components installed increases the chances of an accident. The same holds true on the other side of the coin – even if a forklift is accessorized with the latest and greatest safety components, a careless forklift driver will cause safety hazards. That’s why the OSHA training experts at CertifyMe.net strive for a well-balanced approach to forklift safety. It helps to have the most advanced safety accessories for any forklift, combined with no-nonsense, accessible forklift training. In just 5 easy steps, you can get your OSHA forklift certification with CertifyMe.net. We have a great selection of courses, each made for custom instruction and affordable compliance. Check out our complete course lineup. With our training and the right forklift safety accessories, you’ll be in a great position to work anywhere (warehouse, shipyard, dock, distribution center, etc.) accident-free!